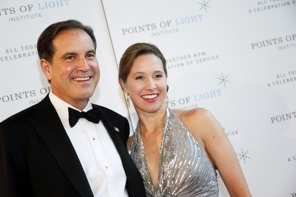 June 11, 2012 - Jim Nantz, lead announcer at CBS Sports and ASA Board member, married fiancé Courtney Richards on the seventh hole at the famed Pebble Beach golf course in California on June 9. Nantz met Richards while she worked at IMG, the sports marketing firm which represents him. In 2010, he proposed to Richards while vacationing in Maine with his longtime friend, former President George H.W. Bush. Those who attended the ceremony included: CBS Sports Chairman Sean McManus, golfers Phil Mickelson and Fred Couples, CBS announcer Phil Simms, WFAN radio host Mike Francesa, New England Patriots quarterback Tom Brady and team owner Robert Craft.